THE BEST OF QUALITY AND INNOVATIONS.. The perfect operation of a reel starts from the rigidity of the body. The distortion of even just one thousandth of the body when the reel is in use, can prevent the fluid rotation of the gears. 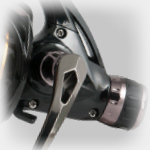 In such situations the reel is prevented from turning properly, forcing the angler to exert extra strength on the fish with the use of the reel.To ensure the necessary rigidity the body structure of our more prestigious reels is made from aluminium league, which is also light and crushproof. are the basis of the mechanical function of our reels. 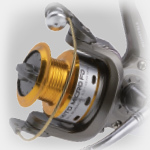 The fluidity and smoothness of rotation that PG provides is responsible for the speed and above all of the power of the reels. The rotors and the gears of our reels are achieved with the PG technology realized with computer 3D. The perfect adhesion of every single gear guarantees an incomparable transfer of the rotation. 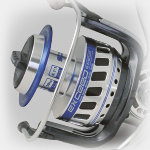 This special system is fitted under the main pinion and is present in our top of the range reels series. It allows a smoother and more fluid rotation and assures the perfect spool movement to ensure that the line is spooled in a perfect parallel way. With this revolutionary system, the rotor turns at a very high speed while the spool makes its turn up and down at a slower speed. This action delivers perfect parallel winding, thereby avoiding the line tension from normal spooling movements and therefore making longer casting easily possible. Even in the highest quality reels sometimes during the cast the bail arm can accidentally close. With this new locking system, fitted onto the rotor, this risk has been almost completely eliminated. The angler is advised by an audible click that the bail arm is locked correctly. Internal gears are the heart of a reel, and for this reason the Trabucco company has always focused its researches in this area in order to offer the angler products that can guarantee fluidity, resistance and long lasting. Many of the Trabucco reels have been provided with the new generation Magnum Force Gear, featuring bronze pinions and stainless steel main assembly. The cold forging technique from the aluminium league achieves extremely light spools with high protection from abrasions and damage, thereby increasing the structural resistance. In the competition and long cast reels, the Titanium edge (lip) of the spool is perfect formed and helps the line exit smoothly during the cast. Traditional line rollers force tension on to the line with every turn of the handle - this can cause unecessary line tangles. The new Anti twist line roller together to the systems WSG and SOS resolve this problem also lengthening the life of even the lightest monofilaments. 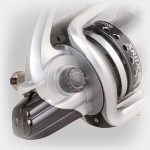 Many Trabucco reel series are provided with an oversized hollow aluminium bail arm. 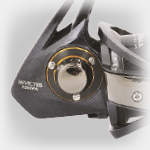 This technical innovation ensures perfect spooling of the line when retrieving, whilst also avoiding line tension. The button placed at the base of the handle allows for closing and reopening in an instant, reducing the encumbrance and protecting from the bumps. A special roller bearing is mounted on the central pinion allowing only one rotation direction. This prevents the reel from even the smallest back turn. Also known as the "One way clutch". When this device entered carp fishing with such force it revolutionised the sport to such an extent it became essential. It is now also much favoured in other freshwater and saltwater applications The lever situated on the back of the body allows the angler to switch from the regulated drag in the “free” position, back to “normal” for fish playing. Is currently probably the best fish fighting system present in the market today. The back lever guarantees instant adjustments of the drag when the fish runs. This means there are two drags present - the micro metric conventional one, and the fight one to be used during the fighting and playing the fish. 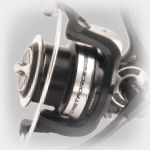 Special reels demand special performance characteristics. 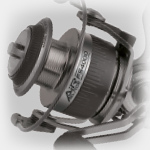 For many years Trabucco has made reels that have provided the angler with the very latest innovations that provide great performance. Our purpose is to be able to offer you products that bring together reliability, performance and technological advances. The new reel collection embodies all these characteristics and for this reason we believe our reels will remain in the anglers equipment for many years. This new technology, realized thanks to the new computers 3D programmes, achieves the construction of perfectly balanced rotors without the addition of external weights. 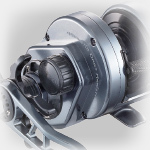 The resulting balance reduces any vibrations of the reel during the recovery. Lighter and stronger than conventional bails, the hollow bails feature a special conical joint that gently pulls the main line into the line roller, even with the lowest tension. The conventional line rollers, every turns of the handle, force the line to twist on itself causing annoying tangles. The Anti-Twist Line Roller dramatically reduces the line twist problem and reducing the wearing of your line. The duraluminium cold forging process allows to obtain exceptionally light and strong spools. In the top of the range models the spool lip is coated by titanium to reduce the line friction and increase the casting distance. Handles are turned from a full aluminum bar - making them stronger, lighter and unassailable by the atmospheric agents.